Cozied in between a dental clinic and The Detox Market on King West is the last thing you'd probably ever expect: a small public garden sprouting herbs, spinach and organic kale. This mini-oasis of flora is planted in a series of crates that look like they were made from reclaimed pallets. 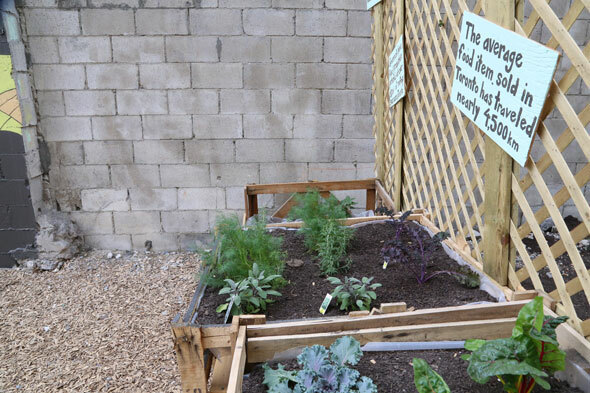 In conjunction with TAS -- and in keeping with its commitment to the four pillars of sustainability â Fresh City Farms planted the farm lot as an initiative (or attempt, at least) to alert people to the many potential locations for city farming. It's also meant to remind us to pay attention to where our food comes from. (Fresh City also delivers organic food boxes to homes around Toronto). The garden's back fence is dotted with informative little handmade signs proclaiming, "The GTA sits on the best farmland in Canada yet Ontario imports $4.8 billion more in food than it exports," and "The average food item sold in Toronto has traveled nearly 4,500 km." The farm lot will be open until it gets too cold for the plants to grow, and it'll remain in place until a building begins to take shape on the lot.